Lions Clubs International is the world's largest service club organization with 1.4 million members in 46,000 clubs in 192 countries and geographical areas. 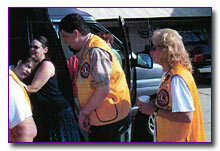 The Humble Lions Club was founded in 1945 and has served the Humble/Kingwood community for over 58 years. 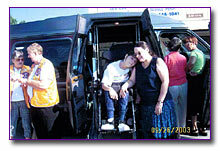 Young Katie Hunn, stricken with Scoliosis, was so surprised when we showed her the van. Everyone's hard work sure did pay off! We collected $23,000 at the barbeque cookoff and auction which will be used for Katie's medical expenses and upkeep costs for the van. 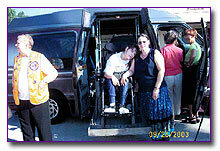 This burgundy and grey fully loaded handicapped accessible van (with electric wheelchair) was donated by Mr. & Mrs. Brent Smith. Thank you to all for supporting this event! You should have seen Katie's face when she saw the van...such joy. Copyright © 2003 Humble Lions Club. All Rights Reserved.